It's so difficult to get a decent photo of Bayley lately. If I call her to catch her attention, she runs over and jumps up on me. If I don't call her, she's always getting into something or chasing the cats.. I got this one just before she jumped up and licked the lens. Bayley can reach up just past my waist now. She just barely can reach the top of our kitchen table, and tries hard to lick scraps off the edge, if she can find any. 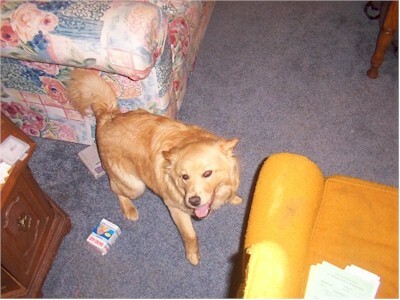 She's quite a good dog, and it turns out that she looks a lot like our old dog, Cookie, even though she's a slightly different mix (golden retriever and chowchow, rather than golden retriever and basset).